On 21 January, at 5pm GMT, Satya Nadella will make his most important announcement since taking the helm of Microsoft just under a year ago. In his presentation, dubbed Windows 10: The Next Chapter, Nadella is set to unveil new features and a new build of Microsoft’s latest operating system (OS) in a bid to fuel industry momentum. After a number of years of slow growth, the PC industry is looking set to rebound, and a new Microsoft operating system will certainly help drive PC upgrades. According to the latest market share data from analyst IDC, shipments of portable PCs increased by 5.3% year-on-year in Europe, while desktop PC shipments contracted by 3.5% in the fourth quarter of 2014. Windows 10 aims to bridge the gap between laptop and tablet users, following its somewhat misguided attempt in 2012 to force the Windows 8 touch user interface on laptop users. Prior to Windows 8, PC manufacturers mainly focused on bundling Microsoft software with their hardware. But today, the major PC makers offer a variety of Android devices, and some, such as HP, also sell Chromebooks as cheaper alternatives to higher-end Windows devices. As a result, desktop computing is much more complex than in the past. But, an HP survey of 1,320 IT professionals found that while a range of operating systems are emerging in the enterprise, 42% still consider Windows as “critical” to their business – a position that almost two-thirds (65%) believe will be retained in five years’ time. Nadella has shown his intentions to steer Microsoft towards becoming a more heterogeneous company, unlike his predecessor, Steve Ballmer, who attempted to maintain Windows’ dominance as a standalone platform. The consumerisation of IT and, in particular, the rise of iOS and Android, has diminished Microsoft’s OS dominance. Rather than offer an alternative mobile platform, Microsoft has been pushing the merits of its Enterprise Mobility Suite, which provides mobile device management (MDM) in a heterogeneous computing environment. Inevitably, for Windows 10 to succeed in the corporate world and with consumers, the operating system will need to fit in seamlessly with Android and iOS devices. Microsoft will also need to prove Windows 10 is the desktop OS for cloud computing and software-as-a-service (SaaS) apps. Microsoft has already shown its hand regarding cloud computing. During its TechEd developer conference in November 2014, it claimed Windows 10 would be simpler to deploy than previous versions. Microsoft will offer Azure Active Directory as a login option on Windows 10 PCs, giving IT departments the ability for users to set up and configure their new hardware via the Azure cloud. Microsoft clearly needs to win back the ground it lost to Android and iOS. 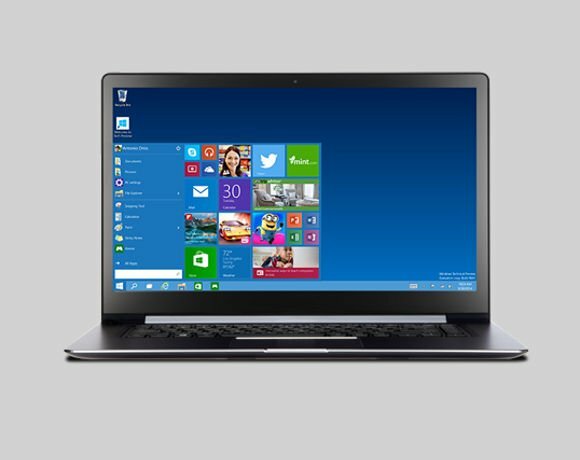 Is Windows 10 the answer? Tomorrow, Nadella will try to convince users it is.